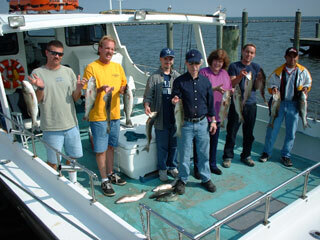 Here we have a crew from The Bozzuto Group on September 28, shown with their fine catch of rockfish. 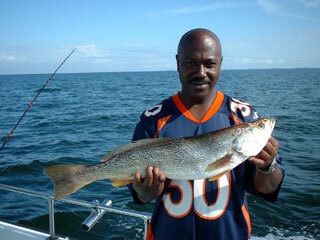 Later on they caught a good number of blues and some Spanish Mackerel. 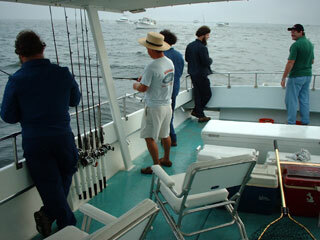 From left to right, that's Eric, Ian, Bob, Peter, Julie Smith (crew chief), Freddie, Randy, and James. 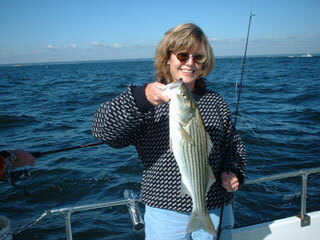 And here's Julie with part of her limit catch of rockfish. 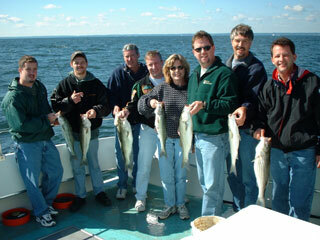 Shown with their limits of rockfish caught September 23, from North Bay Distributors, (left to right) that's Todd, Mike Fox (crew chief and Fox Man), John Jr., John, Judy, Phillipe, and Tony. And here's Lev Volftsun and crew of the Akula, back for another fine day of fishing on September 16 for rockfish, blues, and a couple trout. 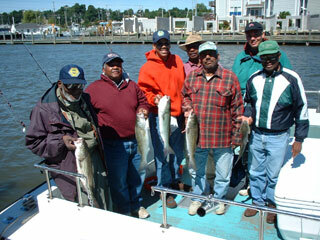 From the Washington Outdoor Sportsman's Club, here we have (left to right) Cox, Pritchett, Dave Lynch (crew chief), Billy, Frank, Phil, and Robert, shown with some of their fine catch of rockfish from September 15. And back again we have the Devin Watson (not shown) crew from September 09. 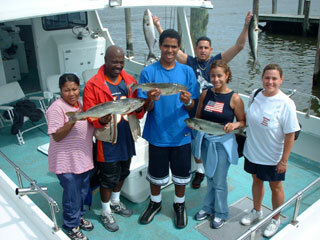 From left to right, that's Melason, Tony, young Devin, Jose (behind), Cynthia, and Danielle. 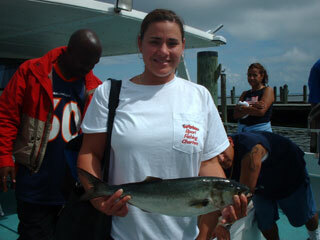 And this crew hails from Strickland Fire Protection, who caught plenty of bluefish while trolling on September 08. And from Green Contracting, here we have a crew led by Randy Eckley on September 07. 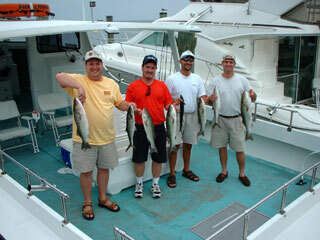 From left to right, that's Pedro, John, Randy, Matt, Larry, Kirk, and Jim. 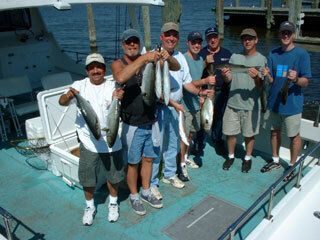 Here's the Brooke Jew crew with their limits of rockfish and a good bunch of bluefish, caught September 01.